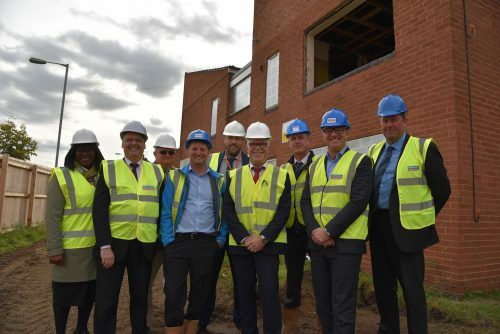 A partnership between A1 Housing, Bassetlaw District Council, Nottinghamshire County Council, with additional funding from the national Homes and Communities Agency, is set to develop an impressive apartment complex for older adults on the site of the former Abbey Grove Independent Retirement Living Centre in Lowtown, Worksop. Planning consent was granted by Bassetlaw District Council in May 2017 and with Woodhead being confirmed as the approved contractor following a competitive tender process through Efficiency East Midlands, demolition work has already begun on site to create the Retirement Living complex. The project has been procured through EEM Ltd. EEM is a non-profit organisation offering efficiency savings for the public sector and all public sector bodies are free to join. Their current Members include Councils, ALMO’s, Housing Associations, Hospitals, Universities and Emergency Services. EEM’s priority is to support Members in their common goal – to provide efficiently delivered and high quality products and services to the communities they serve. Councillor Steve Vickers, Vice-Chairman of Nottinghamshire County Council’s Adult Social Care and Public Health Committee, said: “This redevelopment will expand and improve the quality of extra care housing in Bassetlaw, which offers older people their own apartment for greater independence with on-site support which can be adapted around their changing needs. The Abbey Grove redevelopment will feature 51 comfortable, self-contained one and two bedroomed apartments, including 37 extra care places.